Breakfast will never be so easy with the Morphy Richards 242007 Accents 4 Slice Toaster in cornflour blue stainless steel. 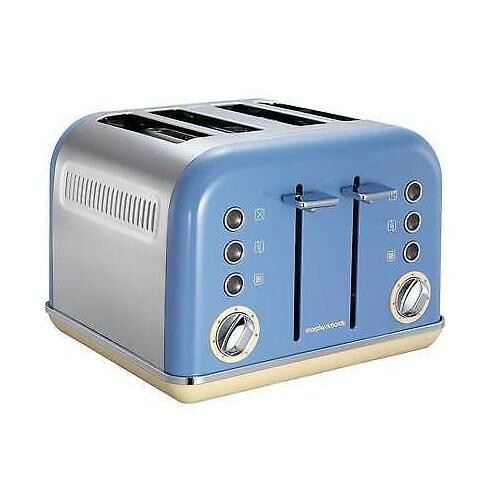 The retro design of the toaster would be ideal for people who desire the complete retro kitchen or just for people who want an elegant retro kitchen appliance. The Morphy Richards 242007 makes life less stressful in the mornings because of its 4 slice feature allowing you to quickly make breakfasts for the whole family. The hidden crumbs tray is another amazing feature of this toaster as it cleanly collects the crumbs and can easily be removed and emptied. The Morphy Richards 242007 Accents 4 Slice Toaster comes with a variable browning control so you can create that perfect toast for all those fussy family members without hearing the words its burnt. The hi-lift feature also enables you to easily remove smaller food such as crumpets from the toaster without burning your fingers.